Home News Go All-In! Exeter students: pitch your entrepreneurial idea for chance to win £10,000! Go All-In! Exeter students: pitch your entrepreneurial idea for chance to win £10,000! Exeter students who develop an entrepreneurial idea this term could win £10,000 plus a boot camp experience to help hone their business plan. The challenge has been set: pitch an entrepreneurial idea for a chance to win £10,000 and attend a boot camp that could help turn your business idea into a reality. That is the prize for the winners of the University of Oxford’s All-Innovate competition, and Exeter students are invited to rise to the challenge. 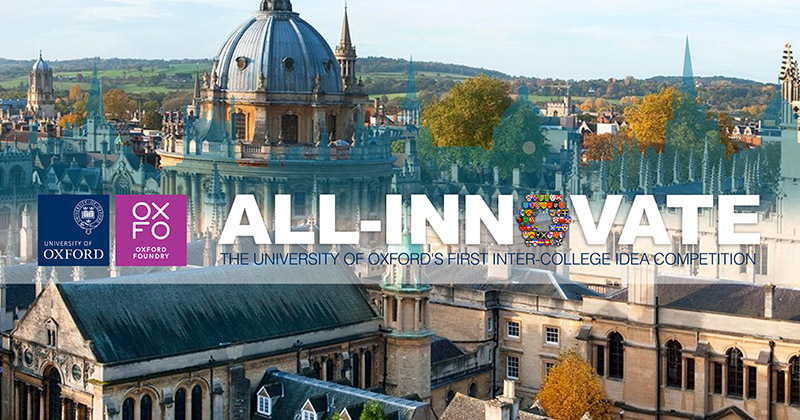 All-Innovate is the University’s first inter-collegiate competition for budding entrepreneurs, run by Oxford’s centre for entrepreneurship, the Oxford Foundry. Students are encouraged to work in teams to develop an entrepreneurial idea and create a pitch, with support from alumni mentors. The winning team will receive £10,000 and two runners-up teams will receive £5,000. What’s more, 10 finalists will be offered a place on a five-day boot camp, designed to support and prepare the teams in their vital next steps to move their business forward. The week will be made up of immersive workshops and deep-dives with experts. By the end of the week, each team will have developed a personal and business development action plan. The competition is open to all current students. Judges are looking for teams who have a light bulb moment and present an idea that captures the imagination. The idea should target a viable market and will offer a positive social impact. Applications are open now and will close on 17 February. Students wishing to explore ideas can take part in a series of workshops run by the Oxford Foundry during Hilary term. They can also find people to bounce ideas off at the Foundry and establish a team.